I never set out to make wedding rings. I work mainly in silver, I don't usually do solitaires or engagement type rings and I have set precious few diamonds in my career. Most wedding rings I see are gold or platinum and bought as a set with an engagement ring. Very little overlap between what I do and what I saw as wedding rings. 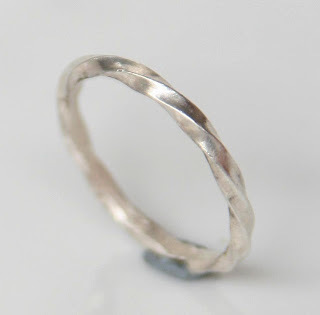 Slowly, however, a few people started buying some of my rings as engagement and wedding rings. The first time it happened, I only found out it was going to be used as a wedding band until afterwards, when the bride let me know that the ring had arrived, that she loved it and that she was using it for her wedding. Then, a couple contacted me for a custom set. I admit that I got a few butterflies in my stomach, since these are such special pieces. 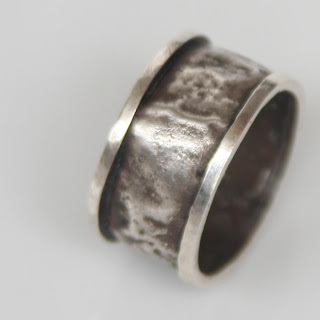 This was the first wedding band I made - and didn't know it! Over time, other couples have asked for custom rings or used some of the bands in my line. Each of them is special to me. Wedding rings have such special meanings and are a symbol of the union. I love the idea that the ring will be worn everyday and loved, will bring a smile to the owner and remind them of a special day and very special person. Some couples ask for custom projects, which reflect their unique views and tastes. The challenge often is in creating a pair of rings that suit two different people, yet reflects their union and work together as a pair. Right now, I can't wait to start working on a pair of bands for a couple that is very close and dear to me. They want something very simple and understated, but still unique. Let's see what the three of us come up with. I haven't updated this blog in such a long time! I am sorry, but I had a good reason (excuses, excuses): my computer decided to no longer recognize a keyboard. While I could use the virtual keyboard for most things (like entering passwords), henpecking an entire post on that thing was out of the question. Everything seems to be behaving right now, but a new computer seems to be closer in my future than I would like. I had a bad case of creative block over the last week or so. Just those days where nothing seems to look right. But I think I broke through it now. I finally set one of my favourite stones, a natural, untreated ametrine in a really amazing precision cut. I love all the reflections and how both colours swirl together. Can you believe there are only 4 facets? And they are so crisp and perfect. Of course, this post took way too long, because the keyboard went kaput half away through. I really hate using the virtual keyboard. But, at least, it makes gaming impossible, so that has to be positive. From sundown today to sundown tomorrow, the victims of the Holocaust are remembered: Yom HaShoah. Please take a moment to think of the victims of the Holocaust and to reafirm "Never again". Now, take another moment and think of all that is happening today, of all the innocent victims and what each of us can do, no matter how small, to stop it.